My Ironman South Africa(IMSA) 2010 training have started yesterday with a 3km swim and 1h50 Bike session. It was a real shock to the system going from 0hrs in a week to almost 3hrs in one day but it was good. I must just be careful not to over train in the beginning as this will just be an instant recipe for a cold if I push my body too much. It's amazing how soon one forget about the early mornings and late evenings. As I woke up at 4am and drove to the gym for my swim session it was dark, wet, windy and cold. I thought to myself the rain during the night together with the cold front we experiencing couldn't have made my start of training more challenging. I was the only one in the pool at that time of the morning. Back are the long and lonely hours of Ironman Training. And to add to this the new Gym has a problem with the pool and they turned the heater down. 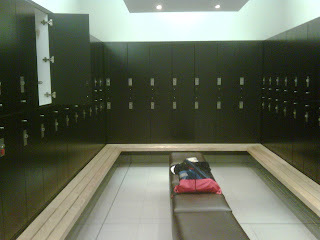 The temperature was 23c, hope this is not a repeat of the old Gym as this was the reason I switched Gyms. What amazed me during the swim was that my times were not bad at all. I don't have the fitness level yet but my speed seemed to improved during the off season. That doesn't make sense to me. I did 4 x 100 meters at the end of my season and all four were between 1:32 and 1:34. When I trained for Kona the best I did was 1:34 and that was during my peak. During the bike session last night I did one 60km lap of IMSA on the Computrainer. When I did the same lap on Saturday I finished in 1h50. Last night I finished in 1h48 and just did and easy 2min spin to get to 1h50. This year I will be concentrating on as they say "pedalling a full circle". Most cyclist push down on the pedal and don't use the recovering leg to pull up. Because I used Rotor Rings on my P3 I could never use the feature on Computrainer to the full potential as the Rotor Rings is oval shaped and "helps" you with the recovering leg getting it over the top. With my P4 I couldn't fit the Rotor Rings to the Zipp Crank and now have the opportunity to utilise this feature. For the whole session I was concentrating on doing full circles and had the PC screen on the spin scan mode. I must say it is really difficult when you pull as hard as you push to make it a perfect circle. Being not used to it I had to concentrate really hard and as soon as my mind drifted off I was back at pushing down and not pulling up. I am also back on the healthy eating wagon and will use the method that worked for me in the past to loose all those off season fat by doing Calorie Counting again. I've seen that my writing down what you eat and looking at the calories burned vs consumed it makes you think twice before eating some high calorie snacks or junk food. Yesterday I consumed too little and need to get the ratio closer otherwise it will just lead to some craving session, if I starve myself. Apart from only consuming 1886kcal the Carbo/Protein/Fat split was also not right. The Carbo ratio was to high with not enough Protein. I finished my session just after 9pm and decided to go to bed to get the maximum hours sleep before this mornings 4am wake up call. Last season I neglected my sleep and some evenings went to bed at 11pm and getting up at 4am. This year I really want to get more sleep as I could feel last year when I woke up some mornings that my body hasn't recovered from the previous day's training. Bike: 60km, 1h50, 131bpm ave, 1574 kCal, 80rpm ave, 221 watts ave.
Good job. I like the calorie counting idea. 1:32 for 100m WOW and double WOW. My best ever is a 1:38 and I'm normally about 1:41-1:42. I'm working on it though but it looks like I've got a lot of catching up to do with you. As for the pool temperature - it sounds suspiciously like both gym's "problems" with the heating is that they're trying to save money!!! Or am I just cynical? Maybe you should train with your wetsuit? Sounds like the rest had done you good though! Thanks, counting the calories works for me but some people say it's too much work writing and calculating everything. But it works for me and sometime we need to do that little extra apart from training to make IM work. You know I never thought about that. Beng the holiday season a lot of members are away for holiday, maybe that is just a way to save some on the electricity bill. I was so surprised with the 100m times, will see if it is still there with tomorrow's session. the calorie count worlked awesoem for me on the going from fat guy to semwhat fit guy, mas I start my training in March I am going to use it as well! the road to getting sick from not eating and resting is short! !